The discovery of iron and how to work it changed human history. Tools, weapons, and daily life haven't been the same since. This is your "tween's" chance to learn to control one of the basic elements of modern human life. In this class he or she will be introduced to the basic smithing techniques of hammering, drawing-out, cutting, bending, and twisting. Using these techniques and a coal-fired forge your child will heat a piece of iron to brilliant incandescence and with anvil, hammer, and tongs create a decorative and useful hook designed to be driven into a post or beam. This class is not limited to tweens (Yes, Mom or Dad, you can take the class, too), but we do try to make sure that the tweens outnumber the older students. The material presented is similar to that in our regular "A Taste of Blacksmithing" and "A Teen's First Taste of Blacksmithing" classes, but with less detailed lecture content, to better suit younger students, and a simpler project -- a blunt-ended drive-hook. Enrollment is limited to four students, so that they don't have to share tools and workspace, and each student gets more working-time and more attention from the instructor than in the teen or adult versions of the class. Students will be 11, 12, or 13 years old. Measure from the first knuckles to the floor with the student standing normally (no shrugging). In this class we cannot safely accommodate (by stacking up enough stuff to stand on) students with a knuckle-to-floor measure of less than 23.5"
Gift Certificates for A Tween's First Taste of Blacksmithing are available. 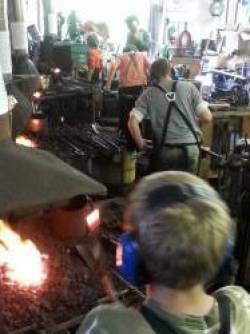 So far, 4 students have applied to be in this A Tween's First Taste of Blacksmithing. This class appears to be full and has 0 on the waiting list. Clicking above will let you add yourself to the waiting list for this class in case someone drops out.